included powered doors, lighting for artwork and general ambiance lighting. Seattle Tacoma International Airport was one of the first airports in the nation to install a subway system to service outlying terminals. When the system opened in 1969 it’s two lines serviced the North and South Terminals with a single track on each loop and a shuttle leg connecting the separate loops. By the turn of the century, system had exceeded its service life and Port of Seattle employees were custom manufacturing parts because replacements were no longer available for the existing trains and equipment. 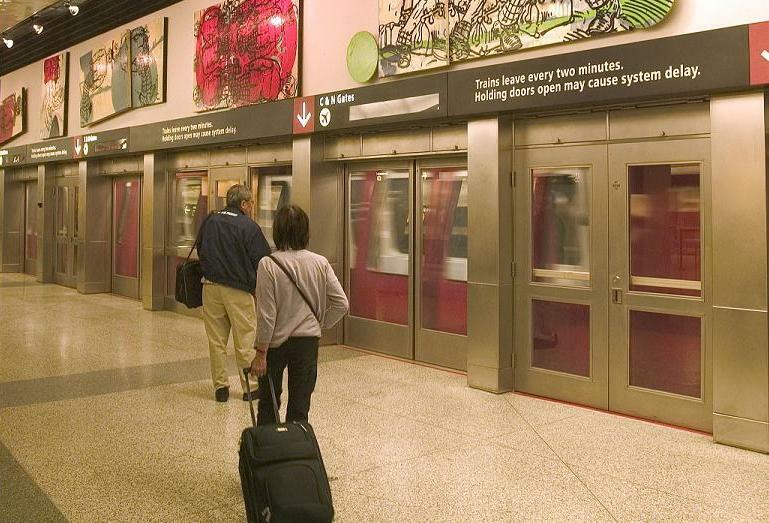 In 2001 the Port of Seattle began a complete renovation of the 8,702 ft. long subway. Over the course of two contracts, the Satellite Transit System (STS) - Power Doors, Transfer/Filler Tables, and Power Distribution (bid in 2001) and the Satellite Transit System (STS) Renovation & Expansion (bid in 2002), the Port’s General Contractor, Bombardier Transportation, replaced and upgraded everything in the subway. Renovations in the tunnels included new computer controlled trains, new track, upgraded lighting, and seismic reinforcements in tunnel walls. Platform renovations included expansion to allow for longer trains, new lighting and power doors, and moving security checkpoints to the ticketing level. Because of Sea-Tac’s high passenger volume, and the limits of the single train loops, scheduling became a critical element of the project. The trains had to remain operational during peak travel periods and work was scheduled when passenger loads were lightest. Within these critical constraints, the contractor and subcontractors reorganized the original work schedules to maximize construction efficiency and minimize passenger inconvenience during the project. As electrical subcontractor on both contracts, Elcon Corporation worked closely with Bombardier, and Port of Seattle staff to schedule electrical work during periods when complete system shutdowns would reduce impacts to airport operations. Work was carefully phased along the lines and, for efficiency during installation, materials and equipment were fully staged in advance of each shift. Elcon’s electrical installations included lighting and power doors at the renovated platforms, electrical for the repositioned security gates, tunnel lighting, coax and fiber-optic for the computerized train controllers and security systems. Innovative scheduling, cooperation and coordination between construction staff and airport operations coordinators, efficient installation practices, and determination brought the project in a full two years ahead of schedule and under budget, while allowing the subway to remain operational during construction. After completion, the Satellite Transit System renovation project was the winner of the 2005 Construction Management Association Project Achievement Award. For further information on our capabilities in this market area, please contact Bart Wanstrom, Chief Estimator at (425) 743-5600.